Last weekend I led of team of 20 individuals, including academics, students and army & navy personnel, into the nuclear plant in Northern Japan that was destroyed in March 2011. The plant is based in Japan’s third largest prefecture, Fukushima, which is about the same size as the small Balkan country, Montenegro. The prefecture stretches almost from the Sea of Japan to the Pacific Ocean, and has over 100 km of coastline. I found that the name of one of Japan’s most important industrial companies, Hitachi, was very visible inside the destroyed nuclear site. The day prior to our visit Hitachi’s stock price on the Tokyo Stock Exchange had risen by 8% on speculation that the company would terminate its investment in a nuclear project at Wylfa in Northern Wales, on the Irish Sea. 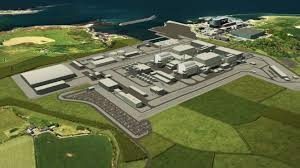 Toshiaki Higashihara, the CEO and President of Hitachi, confirmed last week that Hitachi’s investment at Wylfa would indeed be “suspended” and that the company would take a $3 billion write-down on its Welsh nuclear investment. The reasons for the suspension would appear to be lack of funding and concerns over the profitability of the project. The write-down will cut Hitachi’s net profit for fiscal 2018/19 by almost 60% compared with previous forecasts. Hitachi has a market capitalisation of $30 billion, and employs over 300,000 staff, or about 0.5% of Japan’s total workforce. Last year Hitachi announced its biggest ever overseas acquisition when it acquired one of ABB’s power infrastructure businesses for $6.4 billion. Hitachi’s decision to exit this overseas nuclear project effectively ends Japanese involvement in international nuclear projects, given Toshiba’s decision to exit another UK nuclear project in Moorside, Cumbria and the decision by Japan’s Mitsubishi Corporation to cancel a nuclear project in Turkey in December last year. Russia and China would now appear to be dominating global new nuclear build and KEPCO, the South Korea electricity monopoly, has recently completed a 5.3 GW nuclear project in Abu Dhabi, reportedly delivered on time and on budget. The 8th anniversary of the nuclear accident in Fukushima will be in March this year as the prefecture continues to struggle with the damage, both reputational and real. The global nuclear industry in the developed world is still also reeling from the impact of the accident with bankruptcy of Westinghouse in the US, the forced takeover of South Carolina’s electric power utility, SCANA, by Dominion last year, and these latest project cancellations in the UK that may undermine the UK’s commitment to nuclear power. Japan’s is slowly restarting its nuclear fleet, and Hitachi’s Higashihara said that Hitachi remains committed to commercial engagement in these domestic restarts, and the decommissioning work that flows from dismantling Japan’s older reactors. The current chairman of Hitachi’s Board of Directors, Hiroaki Nakanishi, who is also chairman of Japan’s power industrial body, Keidanren, is also calling for a more open discussion on Japan’s nuclear strategy. The reactors at the destroyed plant in Fukushima were originally built by General Electric and Hitachi, and Hitachi and Toshiba are playing important roles in decommissioning the plant which may cost more than $200 billion and take four to five decades. We look forward to monitoring these nuclear developments with you, and discussing them with you in due course.